A new Kickstarter project called Thermoneystat aims to take the shock out of energy bills by letting you choose how much you want to spend. 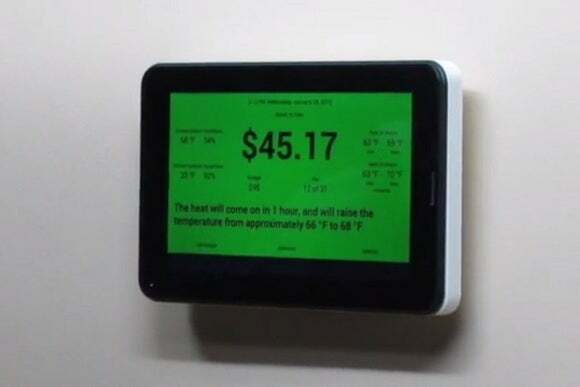 Instead of setting the temperature by degrees, Thermoneystat asks for a monthly budget in dollars, and then tries to make the house as comfortable as possible without over spending. While it doesn't have the fancy home-and-away sensing that smart thermostats like Nest do, it uses algorithms like outside temperature, the weather forecast, historical data, and peak demand periods to limit energy usage. The difference, then, is mainly in what users see when they go to set the temperature. If you're constantly reminded of how much you're spending every month, maybe you'll be okay with easing off the AC a little bit. Thermoneystat claims to be compatible with electric, gas, and oil furnaces, along with air conditioners and heat pumps. It also has a USB jack for power in case you don't want to worry about which thermostat wire can provide power to the device. Thermoneystat will have a regular price of $300 (or early-bird pricing of $200 to $250), and if all goes to plan, it'll start shipping to the first backers in June. However, some big Kickstarter caveats apply: That Makes You Better, the company behind Thermoneystat, makes no mention of past experience mass-producing consumer electronics. It sounds like the company is still figuring out the logistics, and has a rather ambitious goal to manufacture in the United States. The estimated four- to six-month delivery window seems extremely optimistic, especially given that most Kickstarter projects don't ship on time. Why this matters: Regardless of whether Thermoneystat gets out the door, the idea itself is the kind of stupidly clever thing that we suddenly wish everyone else was doing. That Makes You Better says its technology is patent-pending, so even if the hardware doesn't pan out, perhaps there's a long future of licensing dollar-based thermostat algorithms in its future.